The year 2015 was marked by several noteworthy events with particular relevance to international humanitarian law, such as: the continuance of the conflict in Syria, the escalation of violence in Libya, and the eruption of a conflict in Yemen; the official closure of the International Criminal Tribunal for Rwanda (ICTR), and several key decisions by international, hybrid, and national courts related to the adjudication of war crimes, crimes against humanity, and genocide; the establishment by the United Nations (UN) and the Organisation for the Prohibition of Chemical Weapons (OPCW) of a Joint Investigative Mechanism in Syria, and the rising number of States that have ratified the Arms Trade Treaty. This chapter addresses a number of these issues amongst other events of note. 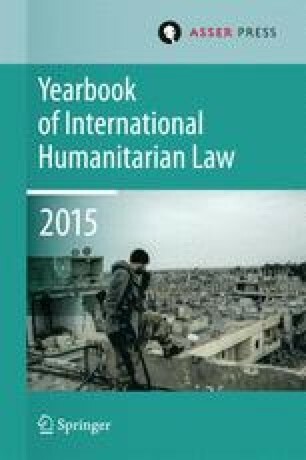 The Year in Review is not intended to be a comprehensive summary of all events that occurred in 2015, but rather a sampling of events of note with particular relevance to the international humanitarian law.